Our Victorian Carolers ensemble will regale vistors to the mill with traditional holiday songs from Charles Dickens's England. Anselma Mill on Pickering Creek was operated as a grist mill from 1725 to 1982 and retains its Colonial era power train from 1747. In 2005, the Mill at Anselma was designated a National Historic Landmark. Today, it's the most complete known example of a custom grain mill in the United States. For further information about the mill or this event, call them at 610-827-1906, email info@anselmamill.org or click here for their website. 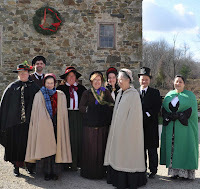 Colonial Revelers will return to Martin's Tavern to provide holiday music for the lighting of the village tree. Martin's Tavern, also called Center House, was built in 1764. The inn played a prominent role during the Battle of Brandywine in 1777. The restored ruins of the tavern form Marshallton's village square, where a large evergreen tree is decorated with lights each year. Refreshments will be served. As a stop on the tour, Victorian Carolers will perform in the sanctuary of the old church that serves as the Society's Headquarters. We'll be there until 5:30 pm, so come early. Tour beautifully decorated houses and historical churches. Refreshments will be served. Advance Tickets: $20; Day of the Tour: $25. All proceeds benefit the The Phoenixville Library and The Clinic. On Saturday, meet at the Phoenixville Senior Center,153 Church St. Doors open at 2:30. For more information, call the Society at 610-935-7646. Colonial Revelers will provide period music and carols at this free event, hosted by Historic Yellow Springs, Chester Springs Library and West Pikeland Township. Beginning at the Cultural Center, with the tree lighting ceremony followed by carol singing and refreshments. Then enjoy a stroll to the Lincoln Building where holiday crafts will be enjoyed by the children. A story time with the Chester Springs Library will also highlight the festive activities planned and Santa will be there. Special food treats will be available to continue the celebration. Colonial Revelers will sing and stroll the grounds for this all-day event. Living history regiments will present firing and medical demonstrations, 18th century sutlers will sell all sorts of goods and baked items, plus you can tour the historic buildings and museum. Check out the battlefield calendar for more info. On September 11, 1777, Washington's troops met the British and Hessians under General Howe at Brandywine for the largest battle of the Revolution.